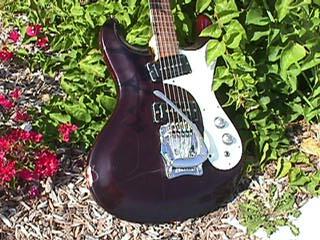 This Mosrite Owners List is provided with Serial Number, Type, Color, Owner's Name, and Picture of the Mosrite. Please submit your info on who has what. 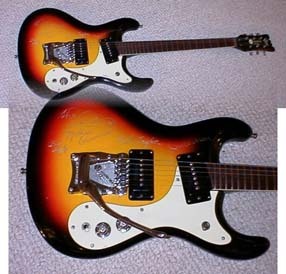 If you find Serial Number Duplication, please do not worry about and believe the both are Mosrite. Every Mosrite is "Built-in-Soul"!!! 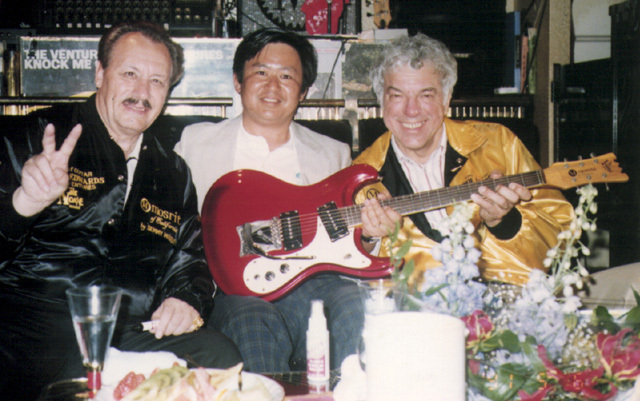 When I met Semie Moseley in 1991, he said "I don't like to examine if Vintage Mosrite or not. My examination would hurt someone. 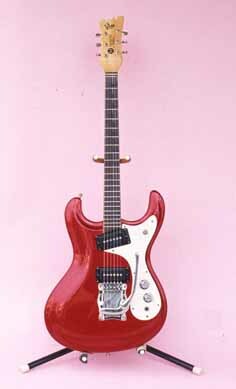 If someone is happy with his Mosrite whatever his Mosrite is, I am also very happy to see such a guy and I don't care his Mosrite is vintage or not." To get full information, I put the information from X-Owners to this list. So the serial number duplication would be seen sometime. 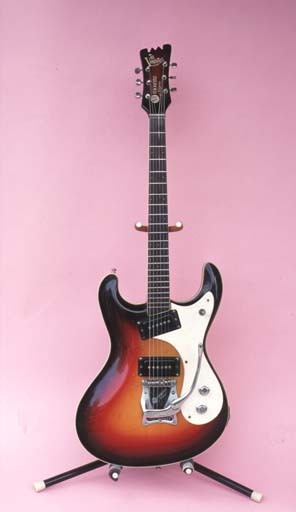 1017 Proto-Model Sunburst Kothenbeutel, B 98-8 1959 bound(binding) sidejack with aluminum mute bridge. 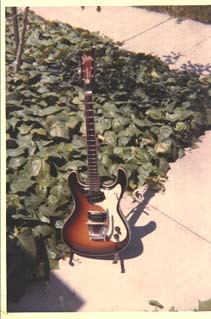 Says Joe Maphis Model on the head stock. Pots date 1958 but Andy Moseley said it was assembled in 59. 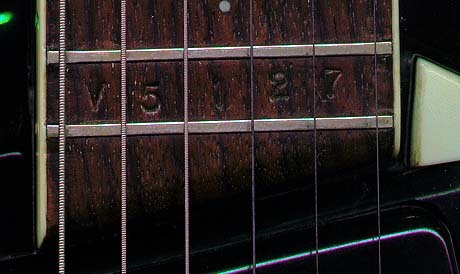 Serial number on back of headstock. Mint condition. 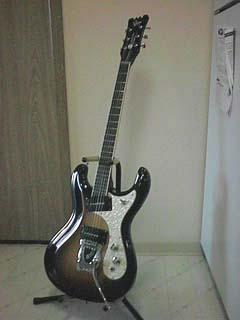 Vibramute Sunburst Nagasawa, K 96-4 Bound(binding) sidejack with aluminum mute bridge. Wood nut. 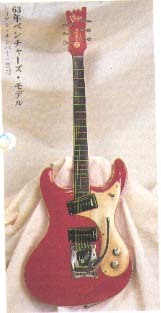 Says Joe Maphis Model on the head stock. 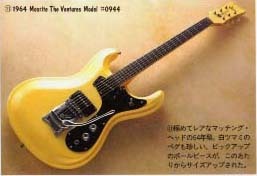 Is it a proto model for 1963 Ventures model?? 0173 Vibramute Sunburst Kothenbeutel, B 98-8 Bound(Binding), Top jack, Bolt on neck(covered), Pick guard screws, Pots dated 49th week of '63. 0190 Vibramute Sunburst Kothenbeutel, B 98-8 Pots dated 49th week of '63. 0365 Vibramute Sunburst Kothenbeutel, B 98-8 Sunburst headstock with large logo. Click 0491 Vibramute Black(ref.) Matsuoka, H 98-9 Org:Sunburst, He was born in 1967. The headstock detail and the serial number detail. (ref.) 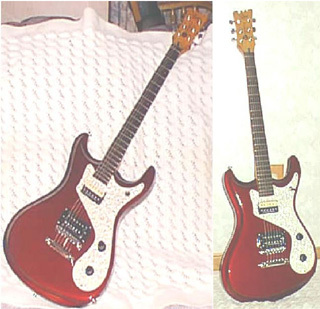 Still,D 97-10 D.Still and Semie were friends and this guitar was at the factory for the refinish when Semie passed away. 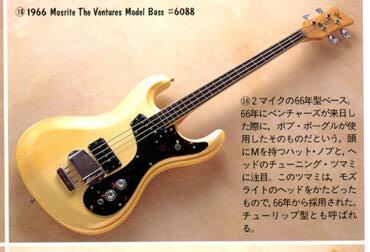 664 Vibramute PearlWhite Kayama,Y Given by the Ventures Summer 1965. The serial number was worn out and hard to read. Click 0913 Vibramute PearlWhite Oyama,Y 98-1 Bought Jan '98 thru DH. The neck joint has Nov '65 marking. Click 0936 Vibramute Sunburst Koslow,K 99-1 1964, Top jack. 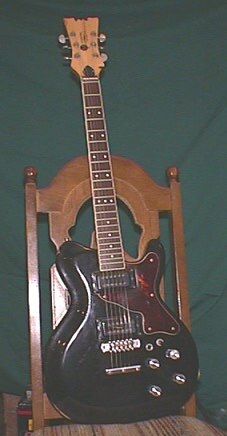 This guitar has had very little home use, and was the first one of its kind in Virginia (USA). Purchased by a fan who knows the group (Ventures) personally. 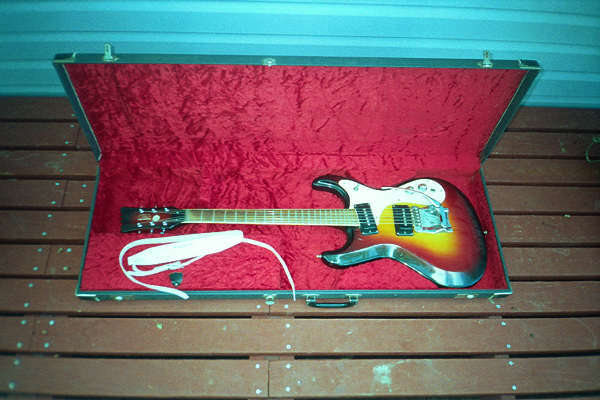 Interested in selling this guitar. Red Kothenbeutel, B 98-8 Has plastic tuning buttons. Click 1165 Vibramute PearlWhite Ishimoto,R 98-7 Headstock close-up and Tailpiece close-up are attached. 1437 Vibramute SunBurst Wertz,G 97-11 X-Owner. Bought in 1966 and sold in 1967. 1696 Vibramute Stripe Kothenbeutel, B 98-8 Red, white and blue striped. 1843 Vibramute Black(ref.) Slug,T 98-5 It used to be sunburst but a previous owner had it redone in black. From Amsterdam. 2034 Vibramute Sunburst HART,J 98-11 I am the original owner of Mosrite Ventures Model, Serial No. 2034. 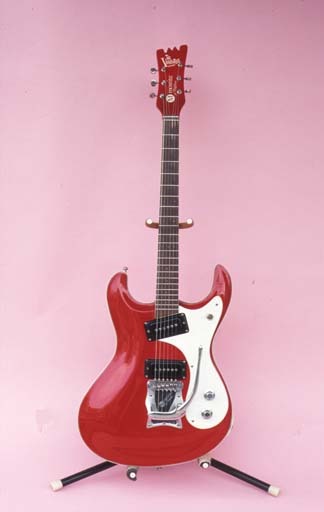 I bought my Mosrite in the summer of 1966. Click 2043 Vibramute Sunburst Edwards, N 98-8 Auctioned August 1998. 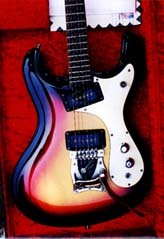 M.Neff reports "When Nokie talked about this guitar you could see his eyes light up. I could tell he was upset by having it auctioned off." 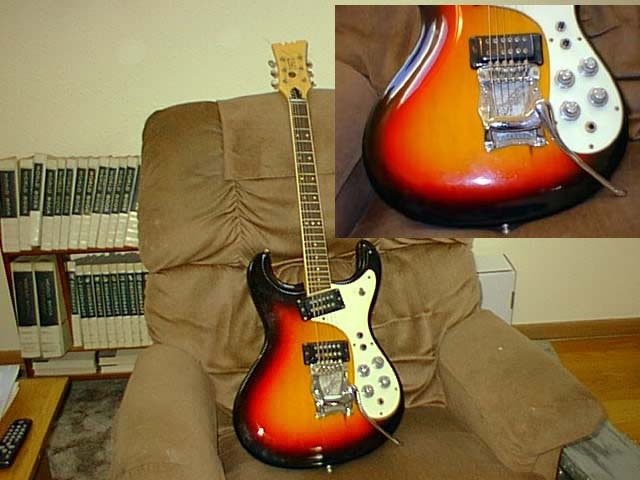 2114 Sunburst MJMSAW 99-1 All original, The pick-ups have the Mosrite logo but no registered trademark R. The tone and volume knobs are the early plain type. I have owned and played this guitar since 1968. 2252 Black(ref) Yakushiji,A 98-10 Bought it in 1983. 2733 Moseley Sunburst Pierce,J 98-6 With Ventures Logo. I've had this since December of 1997. 2759 Moseley White Beal,N 97-11 Tortoise shell pickguard and white plastic button machine head. Currently at Bill Grudgette's shop for a refine. Bill Grudgette was the quality control manager for Semie during 60's Bakersfield production years. He was in charge of all finish procedures. Click 2795 Moseley purple Tubbs,B 98-11 It has a tortoise-shell pickguard. 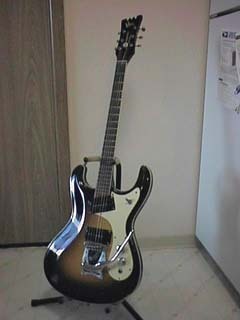 I purchased it 98-10 and it is a 1965 Ventures model. Click 2967 Moseley PearlWhite Halterman,E 98-3 Bought new in 1968. (E.Shigehiro) From Canada. 3637 Moseley Sunburst Gibson,J 98-7 I bought it used in 1971 . 4375 Moseley Pearl White Sims, J 98-7 It is Pearl White with a truss rod adjustment at the headstock. It is in an alligator case and it is in good condition. Click 4617 Moseley Sunburst Barrett,T 98-5 It was　autographed by Nokie Edwards, Bob Bogle, Don Wilson, and Mel Taylor, the　signatures and a "Ventures" logo are engraved into the body. 4774 Vibramute White Chow,W 98-4 I just bought a Mosrite Vibramute that has been refinished. It is white #4774. Want to know Grudgette's shop address for repair. 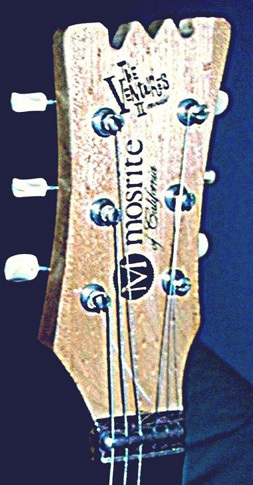 Click V0003 Mosely SunBurst Yates,K 98-4 Non-Ventures model, Headstock that reads Mosrite of California USA, by Moseley. 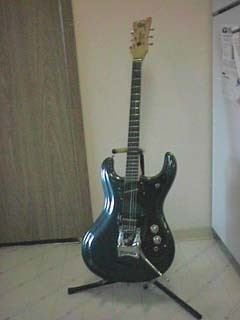 It has Mosrite volume/tone control caps that are taller than those I've seen on other Mosrites. I believe that the tuners may be changed (The heads have 6-sided knobs). All other components appear original. The serial number is V0003 with the left hand side of the "V" having a bar across the top that resembles a "T". Click V0341 Moseley SunBurst Jones,G 97-11 There is no Ventures Model logo, under Mosrite is "of California USA" in small print and under that in smaller print is "by Semie Moseley".Two piece neck. 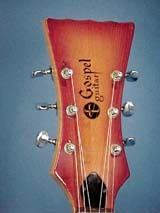 See the headstock detail. 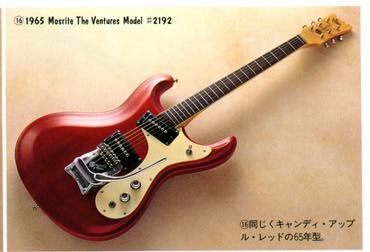 V0623 Moseley PAUL 98-2 With two Mosrite of California pickups. It has a Moseley US Pat.no.3,237,502 with moseley at the bottom. 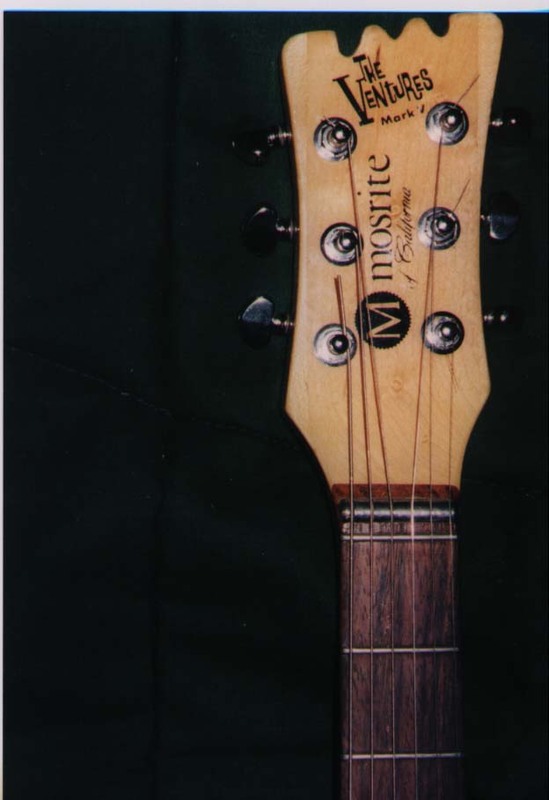 The neck and the headstock are natural and say: Mosrite of California USA by Semie Moseley. This V0623 has the original small book to match. It is also in mint condition. The cases is like new and has the original set of two keys. I purchased this from Rex Crabtree who purchased them from a friend of his that personally knew Semie Moseley's brother somewhere in 1971 or 1972. I would love to see this guitar goes in a museum or under glass in a private collection. I am presently taking offers. 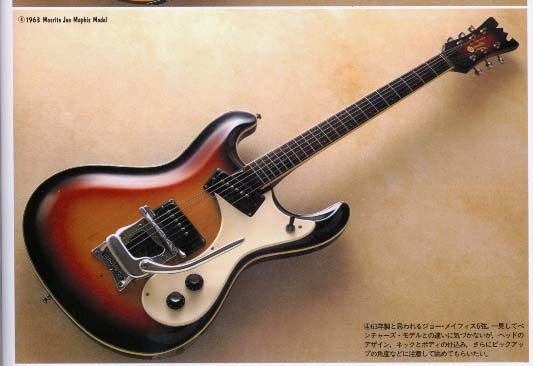 Click V5127 Mosely SunBurst VanFossen,L 98-4 Purchased it in Japan in 1967. 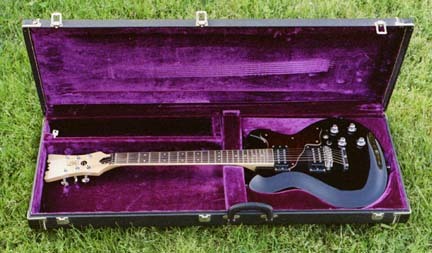 2 pick up SB with the Ventures model logo on the head. 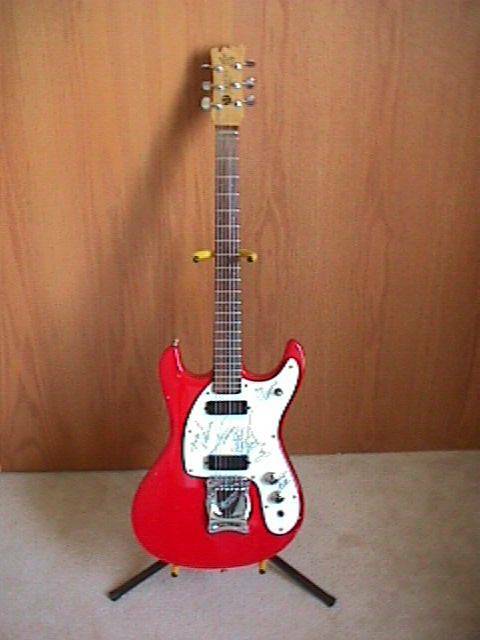 It has the original strap with Mosrite on it and the red felt lined case. Close-up of the serial is attached. V5435 Sunburst Anzik,B 98-6 Does not have The Ventures logo on it. Click V5439 Moseley Deep Purple Pierce, J 98-9 Moseley tailpiece, no ventures logo. Just purchased. Grape Lackey, J 98-9 I bought it from a gentleman down south whose name is Muddy Waters. (not the Muddy Waters). Click V5510 Moseley CandyRed Stadther,D 97-11 Bought 11/7/97, 1968, all original parts, Ventures style without "The Ventures" logo. Click V5642 Moseley Sunburst Phillips, T 98-8 No Ventures Logo on headstock and the neck adjust cover on headstock. It was given to me by my father in 1973. 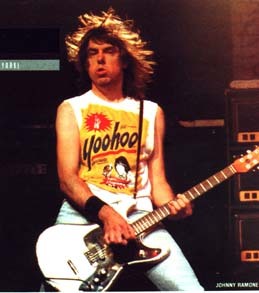 He bought it from a friend that had bought a group of Mosrites at an auction in California. It is all original. 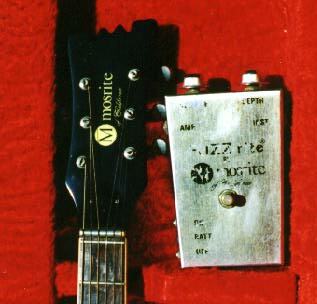 I also have a Mosrite Fuzzrite Guitar Effect. AF034 Vibramute Sunburst Degan,D 98-6 It was purchased new by myself on 6/27 1985. 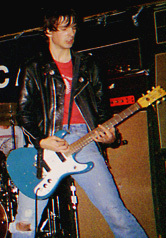 It is signed on the back of the headstock "Mosrite For Ever- Semie Moseley -1984." I spoke to Semie in 1987 and he explained to me the meaning of the 'AF' (After Fire) in the serial number. He told me that he thinks 034 was the last one made in that run. 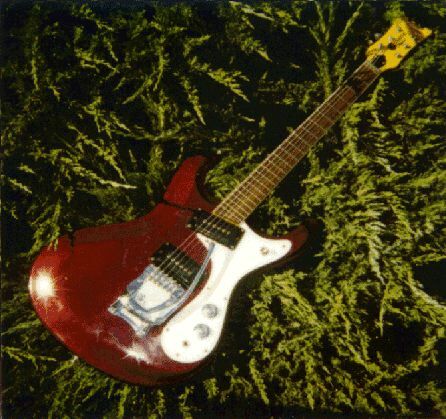 Grape Still,D 97-10 AF:After the Fire of Jonas Ridge Shop, Built in 1984 This guitar was built, and puchased at the same time as the green triple. They both have AF serial no.s, which stand for,"After the Fire",that burned up the original Jonas Ridge factory. It is painted in "California Grape". The bluish streak in the middle of the body is really there. This thing changes colors in the light. It has a wider fingerboard than the green one AF2424, and is better suited for rhythm use. Click AF2424 Green Still,D 97-10 AF:After the Fire of Jonas Ridge Shop,AF2424 is a triple pickup. no guard, translucent emerald green on maple. It has phase tapped pickups. 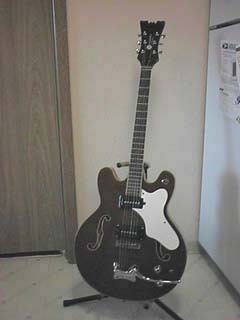 The neck is laminated maple and rosewood with brass dots. It made of maple. 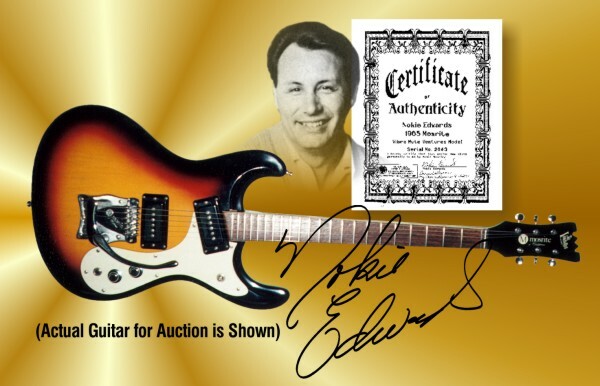 On the back of the headstock it is signed, by Semie, "Mosrites Forever, 1984". HK01 Sunburst Knoght, H 98-2 Had semi build me a sunburst delux venture model 1986( signed on back of head stock) while he was in north carolina. He made a delux sunburst venture model for a music museum in nashvill,ser # rc01, but gave it to me instead and sold it. 3c0062 Moseley PAUL 98-2 This one is I believe Maple. It is just as new condition. 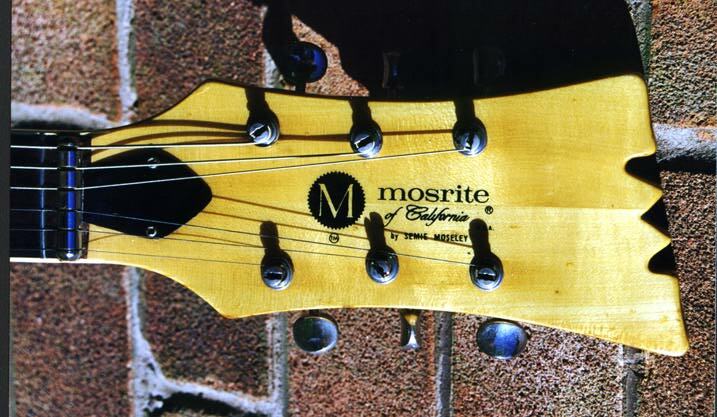 The headstock reads Mosrite of California USA by Semie Moseley. 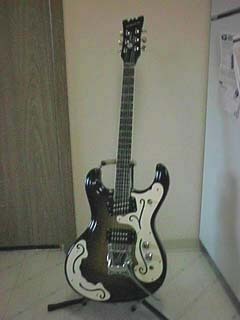 This guitar has the two Mosrite of California pickups and white guard and knob control plate. The case is like new and has the original set of two keys. This was specially made for a Star of The Grand Old Opery. I purchased it from Rex Crabtree who purchased it from a friend of his that personally knew Semie Moseley's brother somewhere in 1971 or 1972. I would love to see this guitar goes in a museum or under glass in a private collection. I am presently taking offers. 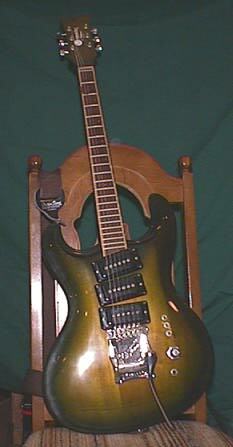 40th Aniv.Proto Dean,R 98-3 Made 1991 and given to me by Loretta Moseley. It is signed by Semie and has a letter of authenticity from Loretta Moseley. Brazilian Rosewood top. Brazilian Rosewood and curly maple neck and back one volume control, no tone control, side jack, wierd tailpiece - tremolo and individual string height adjustments, binding on body, neck and head stock. I am very motivated to sale this fine collector piece. T431 12 Strings Svensson,L 98-5 I am a member of the Swedish Ventures fan club. 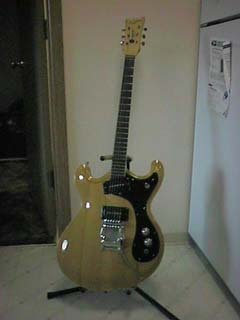 I bought the guitar from an antik instrument dealer in Idaho U.S.A. some years ago. 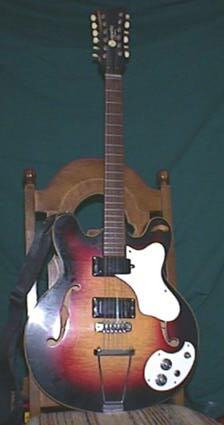 Click T683 12 Strings Sunburst Lackey, J 98-9 All original parts. H0723 Combo Sunburst Hinely,R 98-7 I have a 60's model red/black sunburst/white pickguard, Moseley tremolo bar, maple headstock, serial # H0723, f-hole, original strap (Mosrite logo/white w/ gold), original case. It came with a mint chrome Fender wah/volume/fuzz pedal - Yeah ! All mint condition. The "story" behind it is it was an American soldiers that died in the Vietnam War. His parents sold it to the guy I got it from (dealer) - only $500. H1147 Combo Red Little,K 98-4 I recently purchased a red Mosrite Combo in mint condition, including case (also mint), brochure, and what I believe is the guitar strap originally sold with the guitar. 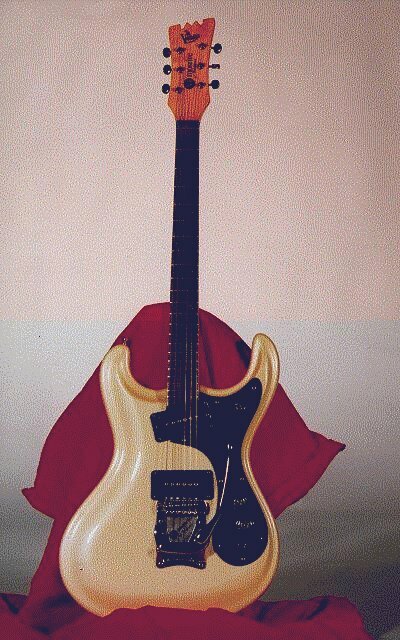 This guitar looks as if no person has ever touched it! 1252 Combo Blue/Green Carte,M 98-2 I've been a working musician in L.A. California for 25 years! 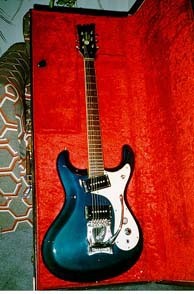 About 20 years ago I had my Mosrite stolen out of my car. 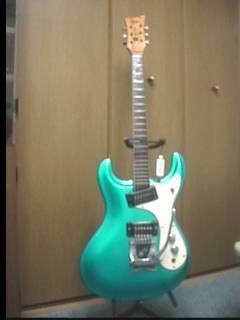 It was the blue/green Combo model #1252. I'd love to have it back. colors Still,D 97-10 Semie's experimantal painting that looks deep blue-green, but changes in the light. Combos were offered either red or sunburst. I found this blue one in Hawaii. When I took it to Semie, he held it all day long. He told me it was an experimental paint job, that was not supposed to leave the factory. It has at least five different layers of paint on it, including black, red and gold, and the blue-green. Click A0513 Celebrity Cherry Yates,K 98-4 It has changed volume/tone potentiometers but otherwise appears original. K0547 Celebrity Marleau,R 98-5 From Canada. 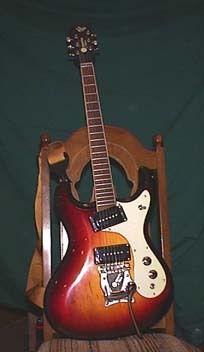 K0948 Celebrity Chadwell,W 98-11 Back in the 1960's, I bought a Mosrite Celebrity 12-string. 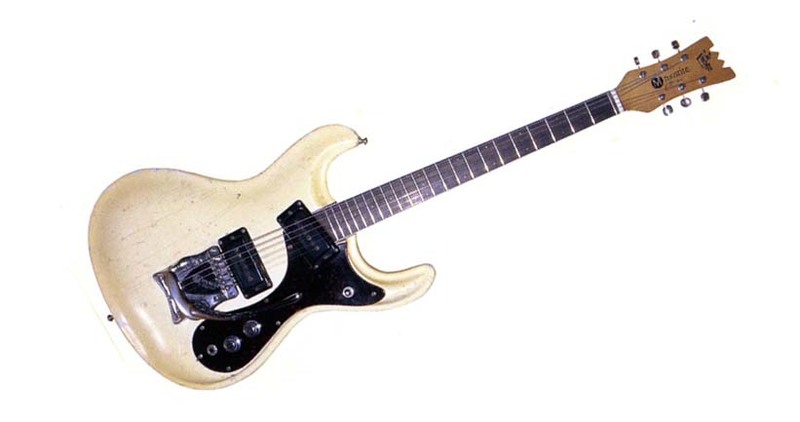 I loved the guitar, but I sold it in 1973. I have recently purchased a Mosrite Celebrity 6-string. It's in pretty good condition, but it needs some work and there are a few things that are different from the original one that I owned. 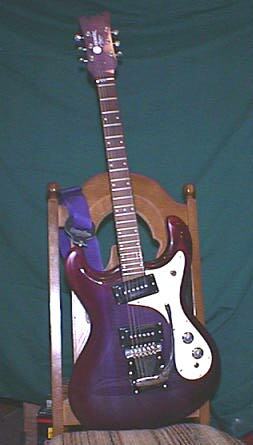 burst Chadwell,W 99-2 It is a 6-string with a vibrato and multiple binding. It is in excellent condition and, if I can trust the pots, it is a 1968. 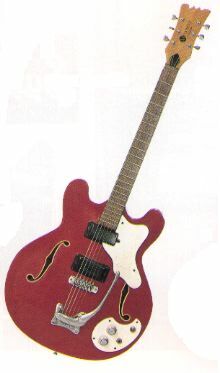 Click B003 Ventures-II Red Egizio,R 98-4 Non-original tuners. Original vibrato has been replaced with a genuine Moseley non-vibrato tailpiece. 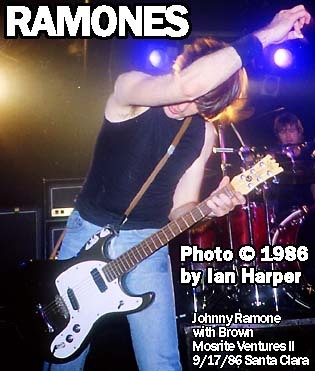 Signed by all of the Ramones on the pickguard. 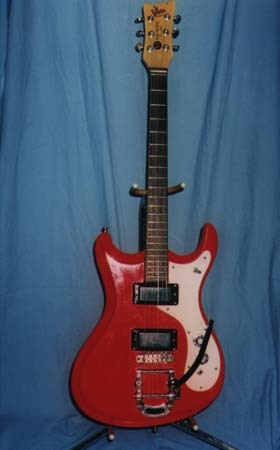 Click Ventures-II Cherry red McGuire,T 98-11 I bought this guitar in 89, it was just the body and neck,everything else was long gone. But for 20 dollars I was shaking! I totally customised it. 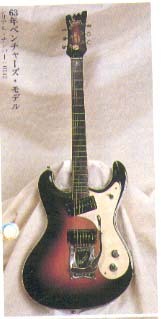 It says THE VENTURES II MODEL on the headstock, though the body shape looks like Mark-V.
Sonic Blue Burbank,K 98-12 The shape is Mark-V but the headstock log is "Ventures II Model". 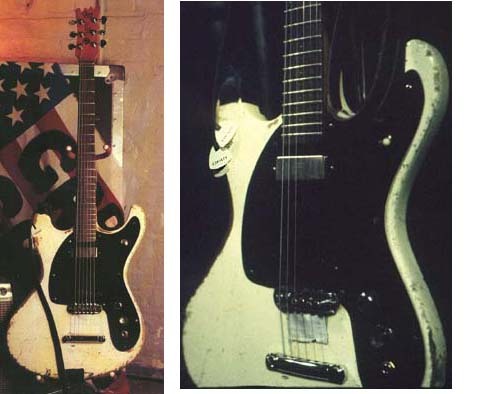 Mark-V was made in 1967, my Mosrite was made in December 1965 and was called a Ventrues II. The date stamped on the back of the neck is Dec 19, 1965. 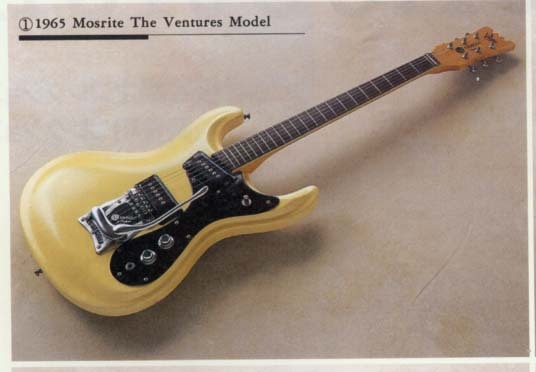 I heard from another Mosrite fan that in 1965, the Mark V and the Mosrite Ventures II were almost exactly the same except for the name and the date they were made. The older Ventures-II had a flat body. 3304 Mark-V Red Buja,B 98-4 Oct. 65. Bought it in 1995. All original except for switch tip　(plastic, not metal). 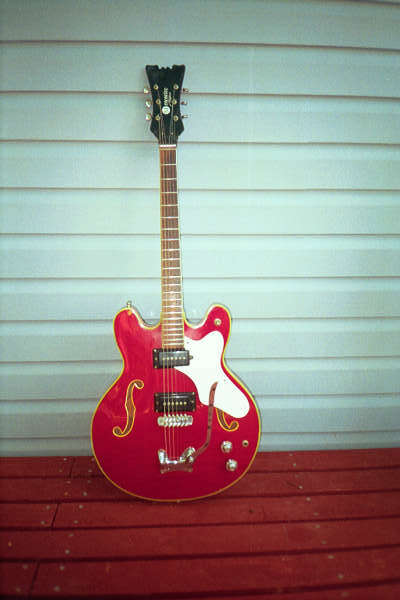 B880 Mark-V Red Lutz,J 98-5 The vibrato is replaced with Bigsby and the tuner is also replaced. 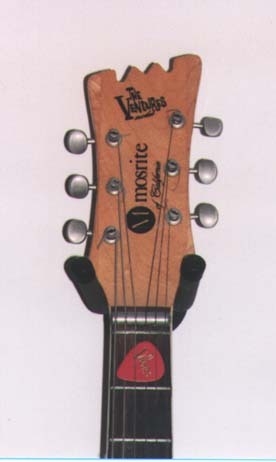 Close-up of the headstock is attached. From France. 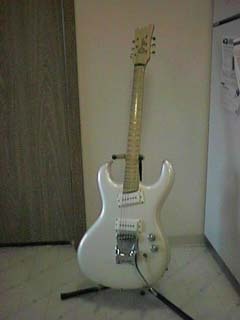 Click Mark-V White(ref) O'Hara, J 97-10 1965, Org:Blue, Non original tailpiece, bridge P/U,tuners. Click D004 Joe Maphis Natural Beal,N 97-11 Forth one made. Has walnut back. D270 Joe Maphis Natural Crawford, R 98-9 It is Natural in color with 2 DeArmond pickups. 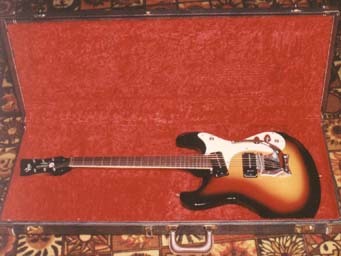 out Joe Maphis '67 SunBurst Perillard,P 98-6 Bought in 80s at Montreal Canada. 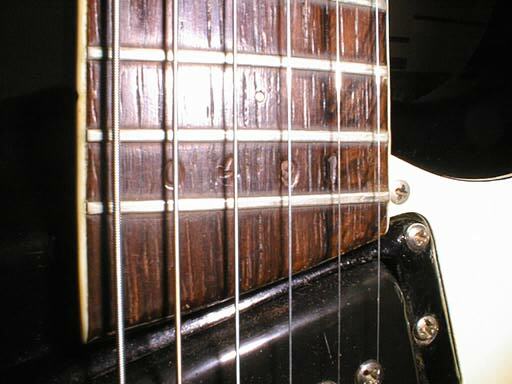 I'm beginning to get　some severe sustain problems caused by sandcasting the frets 3　times!!!. 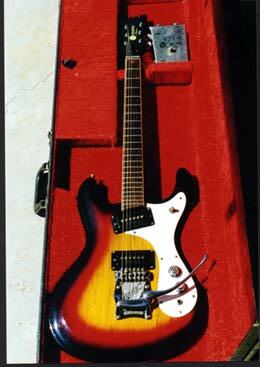 It's a moseley vibrato tail piece with rod upper head adjust and 2 original mosrite machine winding pick-ups. Bender Black Gruggett,D 98-12 Made in 1969. 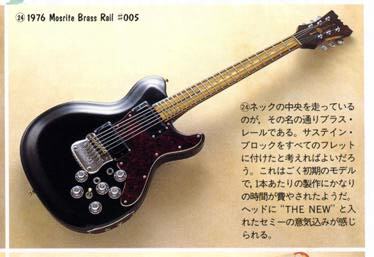 It is black with a red tortoise shell pick guard. The scale is 1/8" shorter than the Gibson scale. 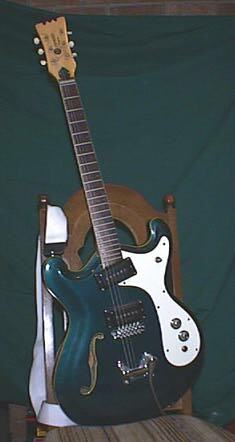 After taking this picture, it has since been completely restored by my father, the master luthier Bill Gruggett, an original member of the Mosrite Guitars team. 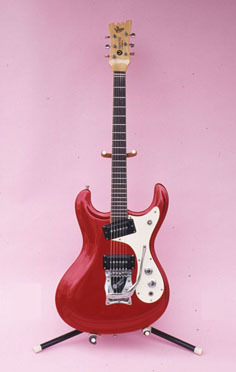 Original Mosrite parts were used from his personal stock, except for new high-quality PC-USA pickups, which I requested. colors Still,D 97-10 Semie's experimantal painting that looksdeep blue-green, but changes in the light. Jack 97-10 Jack Moseley is Semie's brother. Only one made for him in 1966. 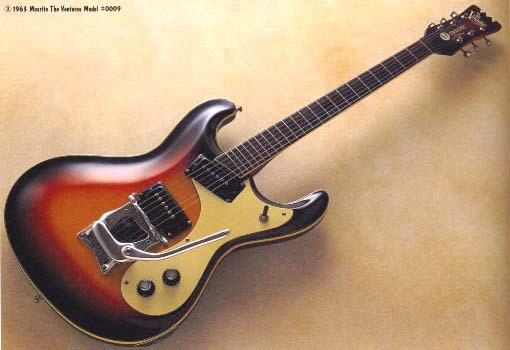 Click 2V0014 V2 Sunburst Fleet,M 97-10 V2 was made in '73 and the V2 business drove Mosrite to go bankrupt. V2 has two humbucker pickups with coil tap switches. 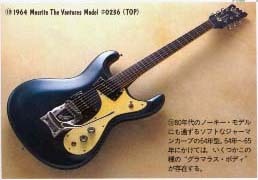 J.Wallace added 6/28/98 as "I think the blue butttons on the v2 are by-pass buttons. Pushing one of these routes the signal around the volume and tone controls directly to the output jack thereby boosting the output of the guitar 10%. Your owners list refers to these as coil taps." 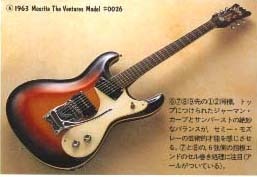 2V0030 V2 Theriault, M 97-10 V2 was made in '73 and the V2 business drove Mosrite to go bankrupt. V2 has two humbucker pickups with coil tap switches. 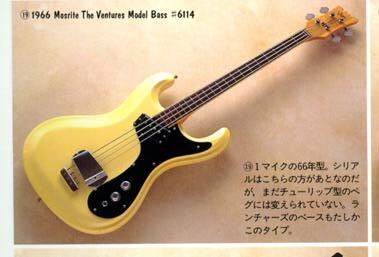 0001 Bass Zunz, I 97-11 With original shoreline gold finish & matching gold headstock. 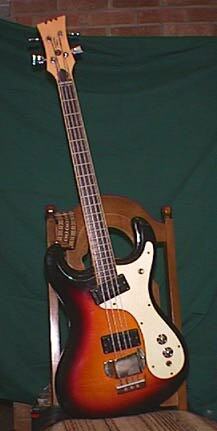 This bass was purchased by Ron Meagher of the Beau Brummels ("Laugh Laugh") in 1964. 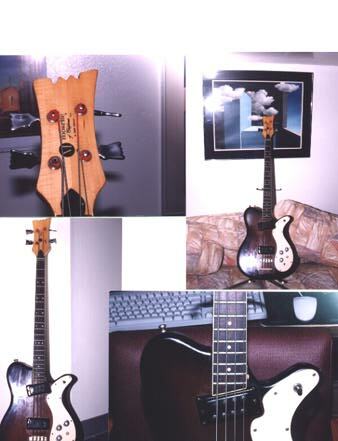 5002 Bass Sunburst Kothenbeutel, B 98-8 Early '63 bound(binding) sidejack bass with mute bridge and very large logo with no "The" above "Ventures". 5018 Bass --- Kothenbeutel, B 98-8 Has been totally stripped. Planning to restore it to blue as on the "Knock me out" album. 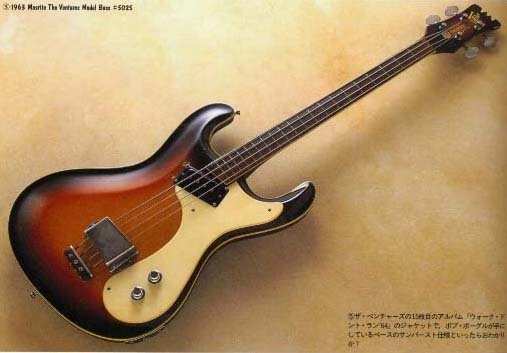 Click 5025 Bass Sunburst Nagasawa, K 96-4 1963, Side Jack, 1 pickup. 5056 Bass Sunburst Kothenbeutel, B 98-8 Top jack, sunburst head stock, large logo. 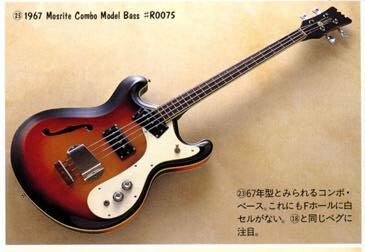 5058 Bass Sunburst Gallegos,D 98-6 1964 Mosrite Ventures Model bass. Needs some work. Would someone be interested in buying it? 5081 Bass White Kothenbeutel, B 98-8 Small logo, white neck and head stock, flat lower horn. Pots date 31st week of '64. 5260 Bass Black Lewis, G 98-8 Mid 60s, 1 pickup, Autographed by Semie. Metallic Lane,J 98-3 Rosewood neck, Single neck pick up. 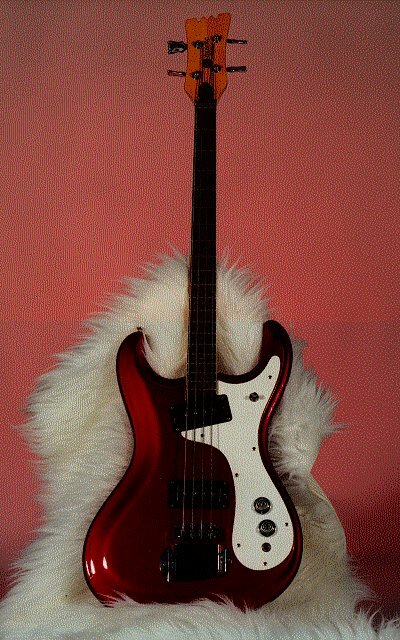 6812 Bass Candy Red Sanders,D 98-12 I have owned Ventures Model Mosrite Bass serial number 6812 since it was new. Originally Candy Apple Red, now blond. 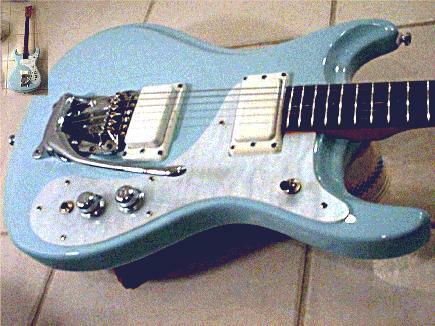 Two pickup, modified in the '80s to stereo. Bridge pickup replaced by after-market type after the original one fell out on stage one night in 1970's. 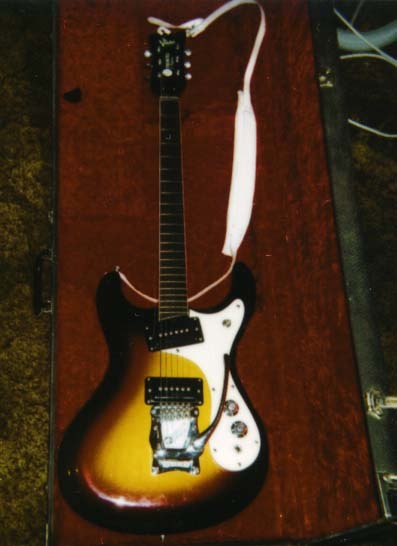 Was purchased as a "second" from Mosrite along with a sunburst single-pickup bass in 1968 by Quilter Sound Company (Now QSC) when Mosrite factory was fabricating speaker cabinets for Quilter. Originally had a blemish in the red paint on the back of the body. Has been re-fretted 3 times in it's career. Click 7112 Bass Cherry Halterman,D 98-3 No Ventures logo 1967. From Canada. Click B0107 Bass Black Smith,D 98-01 Two pickups. 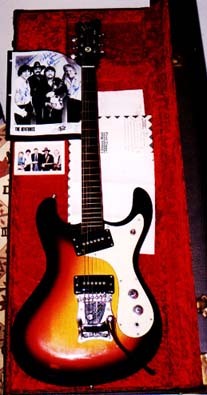 The headstock says "Mosrite of California, by Semie Moseley", but does not say Ventures. What year was it made? Click AB083 Bass Ellis, M 98-7 I have a bass I bought in 1973. It's a Mosrite of California. It's not in the best shape. The chrome tailpiece is missing and one volume button is missing too. Do you know where I can buy a volume button? 02788 M-88 PearlWhite Keith 98-2 It is handmade and signed front and back of headstock by Semie Mosely. 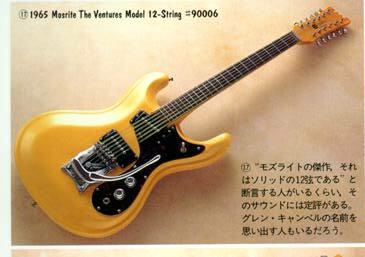 Willing to sell or trade my guitar for a Ventures reissue. M-88 Landry,M 98-2 Semie　signed the face of the head stock " SEMIE MOSLEY" and the back of the head　stock "MOSRITES FOREVER SEMIE MOSLEY 1988"
Click 05088 V-88 PearWhite Beal,N 97-11 Pearl white with white pickups, Flame maple fretboard. 90014 Nokie Model PeralWhite Dean,R 98-3 Made in december 1989. tortoise pick guard, vibramute, new hat knobs (no M), side jack, Signed"made by Semie Moseley 12/89". slab neck, Given to me by semie for christmas. According to Semie, 1 of 3 made. I am very motivated to sale the fine collector piece. 01287 Re-Issue '65 SunBurst Anderson,G 97-11 Had this guitar built for me in 1987. 87043 Re-Issue Emerald Green Kothenbeutel, B 98-8 1987 bound(binding) sidejack with white pickup covers, Vibramute, glued neck, matching neck and headstock. Beautiful and mint. 2507 Re-Issue Silver Kothenbeutel, B 98-8 25th anniversary model, Vibramute, only 12 made. (Although he planned to make 25), very striking. Red Kothenbeutel, B 98-8 '63 re-issue, Vibramute, made in 1991. 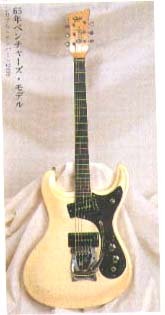 1551 Re-Issue '65 PearlWhite Okamoto, T 98-9 USA Made, Bought Nov. 1997. Click F0286 Serenade Sunburst Lackey,J 99-1 Serenade from '66 or '67 that has the most beautiful tone and ease of play. 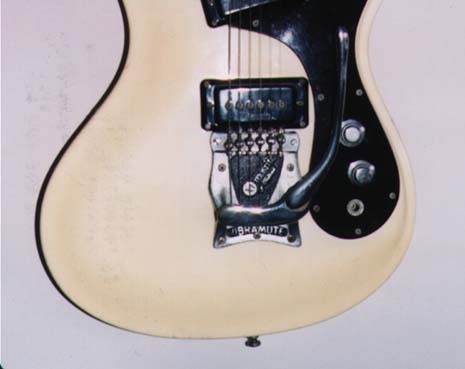 Click 10 Unknown Black Lackey, J 98-9 This item may be a Mosrite Bluesbender that looks closer to the brassrail. I believe it to be a 1976 model. The serial number is 10. I bought it this year from the original owner who bought it at Manny`s Music in New York City. All original parts. 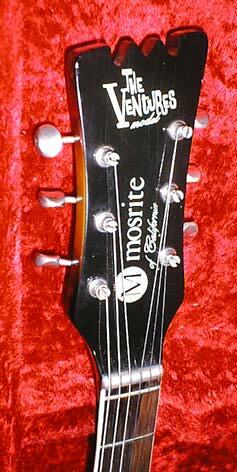 It says the new Mosrite of California on the headstock. 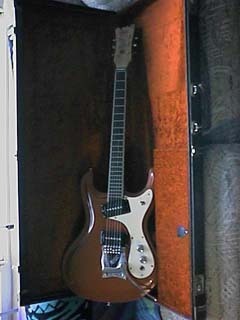 Anyone with info on this guitar or just Mosrite fans are welcome to e-mail me at mhlackey@erols.com. The above list is not for Sell/Buy Information. I'm not responsible for the information given by these Sell/Buy links. 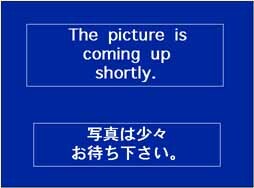 To update the above Owners List, send your information to Kiyoshi Mochizuki, Yokohama Japan. 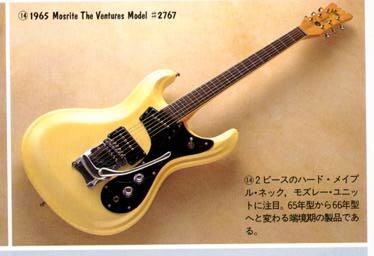 Sending me a picture of your Mosrite Ventures Model is appreciated. Either one of Photo Print or JPEG/GIF File is welcome. 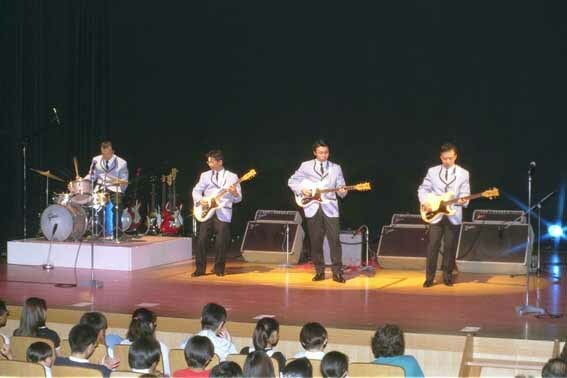 Jump to "Mosrite & the Ventures Page"
Jump to "The Ventures concert & Nokie's concert"